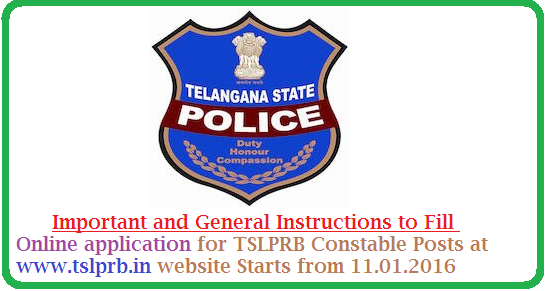 Online Applications Submission through online mode From 11-01-2016 to 04-02-2016 at www.tslprb.in. Candidate Should not Submit more than one Application. The Telangana State Level Police Recruitment Board (here in after referred as Board) is not responsible, for any discrepancy in the application particulars while Rc.No. 151/Rect./Admn-1/2015, dtd. 31-12-2015 submitting the form through online. The applicants are therefore, advised to strictly follow the instructions in their own interest and to verify the contents before submitting the online application.